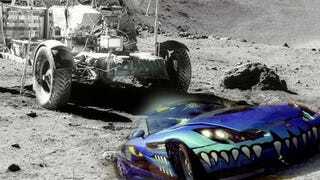 Burnout Paradise On The Moon? A post on Burnout developer Criterion Games' website reveals plans for downloadable content that never made it to fruition, including boats, helicopters, time travel, and yes - Burnout on the moon. Burnout Paradise was originally envisioned as a series of islands all connected to Paradise City through bridges (or potentially boats! ), but something changed after the game was released that shifted Criterion's focus on DLC. Criterion figured Stunt Run and Ranked Racing would be the online modes everyone would be playing, but instead, players flocked to the Free Burn Challenges, so the developers shifted gears accordingly, scrapping the idea of multiple islands filled with different game types, including one marked up like an F1 course. Drat. The other scrapped plans are even more interesting. They envisioned boats racing from island to island, planes and helicopters flying overhead, and cars versus motorcycles ala Road Rash. They considered a network of underground racing areas, and time portals that would temporarily warp you to the Old West. But by far the most out-of-this-world idea was Burnout on the moon. Again, completely true. Someone on the team said that 'players want the moon on a stick when it comes to DLC' We thought that was funny and thought we'd do it. The actual surface of the real Moon was modeled and it was drive-able. Lunar Challenges would have been totally unexpected - as would have been zero gravity Takedowns and Challenges. Agreed! Check out the link below for more on Criterion's overly ambitious DLC plans, and imagine what might have been.